The jolt Mario Draghi is set to give the euro-area economy may well be his last, economists say. The European Central Bank president will announce an extension of asset purchases on Thursday at the current pace of 80 billion euros ($85 billion) a month, according to most economists in a Bloomberg survey. Slowly accelerating inflation and a moderate but steady recovery will then give Draghi room to start tapering by late 2017, three quarters of the respondents said. Policy makers have become more vocal in stressing the risks and limits of their ultra-expansionary stance, in a sign that a discussion about scaling back bond buying is drawing closer. With a decision on the 1.7 trillion-euro quantitative-easing program coming just four days after a referendum in Draghi’s native Italy, and looming elections in Europe weighing on governments’ willingness to overhaul their economies, the onus remains on the ECB to ensure stimulus will be sufficient. 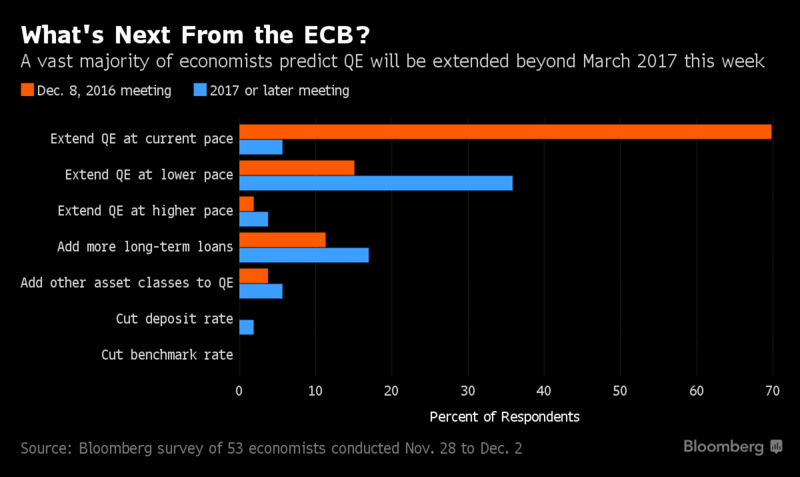 Eighty-nine percent of the 53 economists surveyed from Nov. 28 to Dec. 2 expect the central bank to announce fresh stimulus or QE changes after its Thursday meeting. An extension of QE will require the ECB to tweak some of the parameters that regulate the program, according to 88 percent of respondents, even if an increase in bond yields has alleviated concerns that the central bank will face a scarcity of debt to buy. Despite tensions surrounding the U.S. elections and Italy’s referendum, the 19-nation economy has lately sent encouraging signals. Unemployment dropped to the lowest level in seven years in November and manufacturing activity accelerated, bolstering the inflation outlook. The ECB will publish updated projections on Thursday that will include a first outlook for 2019. 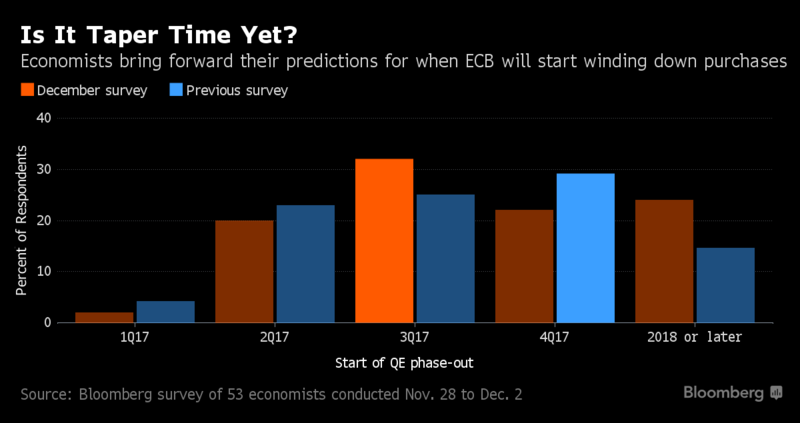 Seventy-six percent of economists predict price growth will be back in line with the ECB’s goal of below but close to 2 percent before Draghi’s term runs out in 2019, up from 66 percent in October. With confidence in a lasting rebound in inflation rising, economists have brought forward expectations for when the ECB will start to wind down stimulus. Tapering will start during 2017, according to 76 percent of respondents, with the third quarter seen as most likely.